Bernard Cribbins stumbles up the wooden steps, flounders onto the stage on all fours for all the world like a huge unwieldy Womble. Before standing to acknowledge the warm audience reception, and shuffling towards the blue-green armchair placed centre-stage. There’s a music stand to his left, and local musician Julian Butler’s keyboard still further away. Bernard Cribbins in 87. This is story-time. He begins by reading the opening chapter of ‘Wind In The Willows’, which – although he reads it with obvious affection, is perhaps a tad too long for some attention-spans. But then again, here at the 300-seater Polka Theatre, it’s not quite clear who is the target audience. 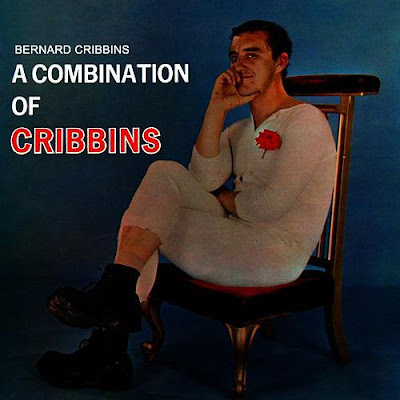 The Cribbins cult-appeal spans generations, and each has its own following. Some know him through Cbeebies’ ‘Old Jack’s Boat’ or ‘Jackanory’, to others he’s the station porter in ‘The Railway Children’ (1970). Even before we get to the hit singles, the Wombles or Dr Who. The Beatles were initially dubious about signing to Parlophone, because the label was best known for its comedy content, even though John Lennon loved George Martin’s work on the Goons’ surreal nonsense, as witness his own ‘A Spaniard In The Works’ effort. And comedy records were a big deal at the time. Charlie Drake had started out on Parlophone by covering Bobby Darin’s novelty Rock ‘n’ Roll hit “Splish Splash” and following it with his version of Larry Verne’s US million-seller “Mr Custer” – about the nervous cavalryman approaching the Battle of Big Horn. Drake found his true comic niche with “My Boomerang Won’t Come Back”, under Johnnie Spence’s direction and George Martin’s production. Benny Hill scored a series of successful singles before “Ernie, The Fastest Milkman In The West” gave him a no.1, including “Transistor Radio” which spoofed various Pop Stars, including Elvis’ “Are You Lonesome Tonight”. Morecambe & Wise issued singles – including their answer-disc to Gerry Goffin’s insider tongue-in-cheek “Who Put The Bomp”, responding as “We’re The Guys (Who Drive Your Baby Wild)” (HMV POP957), plus their 7” 45rpm Pop harmony-group TV routine “Boom-Oo Yatta-Ta-Ta” (1962, HMV 1240). It’s probably best not to even linger on Ken Dodd’s successful career-arc as an unlikely romantic balladeer! But there was also a big market for comedy LPs by Tony Hancock and Kenneth Williams, adapting or modifying radio shows. A practice that continued with the Monty Python vinyl LPs of the 1970s. The two hits establishing Bernard’s image as the working-bloke always ready to stop for a fag and another cup of tea. In the former record, he gets the better of an interfering ‘bloke in a bowler’ city-gent, in the latter he’s shifting an object – presumably a piano, by half-demolishing the house around it. 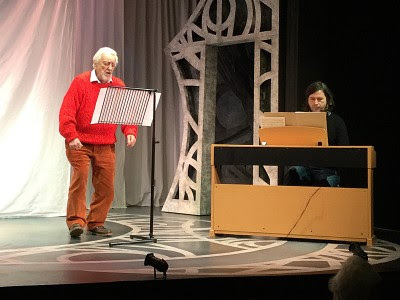 When he does a jaunty version of the song now, he uses lyric-sheet prompts from the music-stand, stomping his feet to the simple keyboard accompaniment. The sound-effects of falling rubble, twanging hinges, heavily ascending boot-steps are obviously missing, but he does the fade-out commentary word-perfect ‘I said to Charlie, ‘we’ll just have to leave it standing on the landing, that’s all, you see the trouble with Fred is, he’s too hasty, you’ll never get nowhere if you're too hasty.’ He saves “The Hole In The Ground” as a request item in the Q&A session, standing behind the chair and slapping out the rhythm on the chair-back, apologising in advance for not remembering the words – but remembering them anyway! 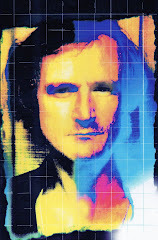 Myles Rudge, who penned lyrics for the two hits, also wrote the liner notes to Bernie’s ‘The Hole In The Ground’ EP (GEP-8859), explaining how the record ‘zoomed straight into the Top Ten. Bernie received this information in a stunned silence, then said – ‘How dolly!’ and went fishing to try and work out how it happened. He still doesn’t know. To reporters who asked for some sort of explanation he said – ‘Don’t ask me, I’m just the nit who sang it!’ An amiably engaging figure specialising in a slightly befuddled air, he’d begun as a straight actor – or ‘as straight as it’s possible to be with that kind of face’, according to Rudge, an actor who accidentally stumbled onto vinyl through recording a number called “Folk Song” (1960, R-4712, c/w “My Kind Of Someone” with Joyce Blair) which he’d performed at the Fortune Theatre as part of the ‘And Another Thing’ revue. He does talk with affection about a track called “The Tale Of A Mouse” on his tie-in LP ‘A Combination Of Cribbins’ (1962, PMC 1186). Even though ‘the love of the mouse was as big as a house,’ the tiny rodent’s romance with an elephant is doomed, so it falls in love with a horse instead! ‘Next time I come here I’ll make sure that I have it in my head and I’ll do it for you. It’s a lovely one’ he promises. It’s one of twelve tracks directed by Johnnie Spence in sessions supervised by George Martin, the comic cover-art pose, with him wearing all-over white ‘combination’ underwear belies his straight melodic interpretation of “I’ve Become Accustomed To Her Face”. Yet the album also includes his third light-hearted single of the year, “Gossip Calypso” c/w “One Man Band” (R-4961) – ‘hear all about it, Yakka-Yakka-Yak, ev-ery woman up at the window, giving out the gossip and getting it back’, written by Trevor Peacock. It enters the ‘Record Mirror’ chart at no.38 (20 December), and crossed over into the new year, peaking no higher that no.25 (3 January 1963), in a chart headed by Cliff Richard, Elvis Presley and Frank Ifield… and with the Beatles “Love Me Do” one rung higher than he was! 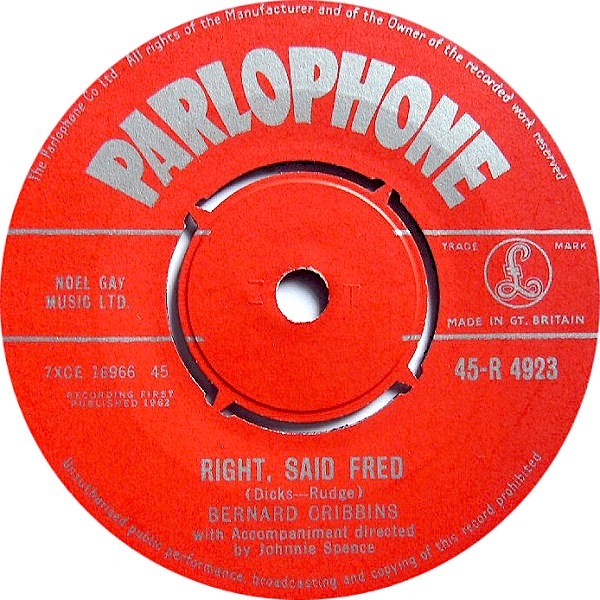 There was another single the following year, “The Bird On The Second Floor” (R5025) – a slightly skewed Dicks-Rudge love-song interjected with ‘cor, these stairs, why don’t they get a lift in here?’, flipped with a baroque-Shakespearean spoof called “Verily”. A further single, one of a number of covers of “When I’m 64” (June 1967, R-5603, c/w “On My Word”), eventually found itself on the compilation LP ‘Sing Lennon And McCartney’ (1970, Music For Pleasure, MFP 5175), alongside the likes of Billy J Kramer, Cilla Black, Peter & Gordon and Kenny Lynch. But by then he’d moved on to other things. In today’s ‘Jackanory’-style session, wearing a big sloppy red jumper, he reads one of AA Milne’s ‘Winnie The Pooh’ stories, the one in which Christopher Robin puts on his Big Boots for an ‘Expotition’ to reach the North Pole. It is not one of the stories that Bernard recorded as a ‘Sunday Times: Selected Stories From Winnie The Pooh’ (2002) CD. ‘But we’re here in Wimbledon’ he enthuses, ‘so how could I not read a Wombles story?’ And he proceeds to read “Orinoco And The Rabbit Hole” – ‘getting stuck in a rabbit hole can be a very upsetting experience,’ from Elisabeth Beresford’s debut 1968 collection about the furry eco-friendly rodents whose names were apparently selected at random from a world map, Tomsk, Tobermory, Great Uncle Bulgaria and – ‘a fine figure of a Womble’, Orinoco himself. Of course, Bernard was not only the perfect narrator-voice for the two TV series of 1973 and 1975 (sixty five-minute episodes) which made them national stars, but also led ‘Orinoco’ onstage to guest on Cilla Black’s January 1974 TV special! ‘Underground, overground, Wombling free,’ their celebrity was accelerated by Mike Batt’s catchy series of spin-off hit singles, utilising session musicians of the star calibre of Chris Spedding (guitar), Ray Cooper (drums) and former-Tornado Clem Cattini. Among the eight hits following “The Wombling Song” (no.4 in October 1973), Batt expanded his ambitions into the classical affectations of “Minuetto Allegretto” (no.16 in October 1974) and the lavish Fred Astaire-style “Wombling White Tie And Tails” (no.22 in April 1975), while still finding time for “Wombling Merry Christmas” (no.2 in December 1974). It’s rumoured that for one ‘Top Of The Pops’ appearances the Womble costumes were actually occupied by Steeleye Span, who were also benefitting from Mike Batt production at the time. 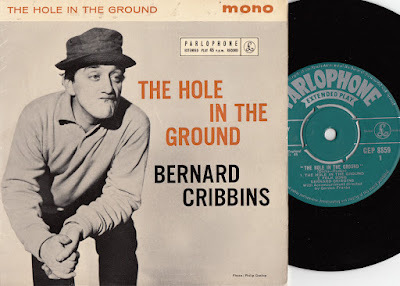 As with all character actors you feel you know, there’s a lot more to the Bernard Cribbins filmography than you suspect. You forget that he was ‘Mr Hutchinson’, the pretentious spoon-salesman guest in “The Hotel Inspectors” episode of ‘Fawlty Towers’ (10 October 1975). He was in three ‘Carry On’ films – ‘Carry On Jack’ (1963), ‘Carry On Spying’ (1964) and the ill-advised ‘Carry On Columbus’ (1992). He can also be seen in ‘The Avengers’ (1966 and 1968), ‘Space 1999’ (1976) and as ‘Wally Bannister’ in ‘Coronation Street’ (2003). He was also the belligerent barman in Alfred Hitchcock’s ‘Frenzy’ (1972). And much much more. 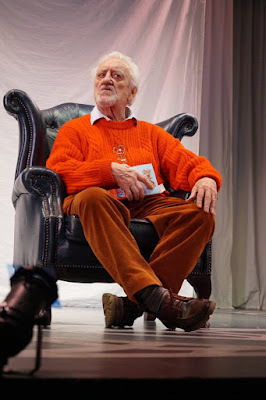 In the final Question-and-Answer wind-down session, one boy – possibly prompted by his father, enquires what it was like working on ‘Dr Who’ with Tom Baker. Apologetically Bernard explains that it was the David Tennant-era Doctor in which he features, as ‘Wilfred Mott’, Donna Noble’s (Catherine Tate) grandfather (from “Voyage Of The Damned”, the Xmas Day Special 2007, recurring through to the two-part “The End Of Time” episode Xmas Day 2009). 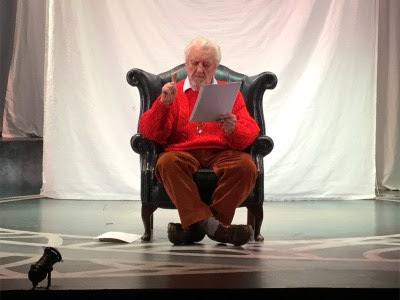 Although, he does delight in launching into an anecdote about once being auditioned by producer Barry Letts as a possible replacement-Dr for the retiring Jon Pertwee. Suggesting to Letts that he’s handy in a fight-scene, Bernard was tut-tutted with a reprimand that the time-travelling Gallifreyan never hits anyone! Later, tuning in to watch Tom Baker filling the role he’d been turned down for, he was amused to see the new Doctor immediately punching out a bad guy. Bernard seems agreeably happy to talk, and to reminisce. 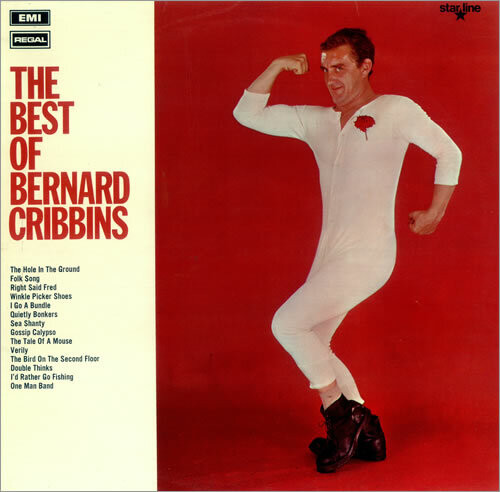 Yet he, perhaps modestly, fails to mention that the Cribbins name also forms a unique 42-year link in the ‘Dr Who’ mythos by bridging decades back to his earlier appearance in the movie ‘Daleks – Invasion Earth: 2150AD’ (1966, Amicus). 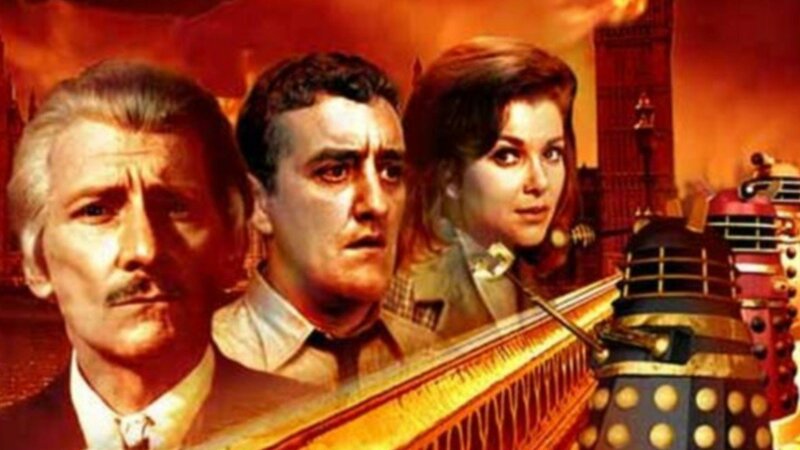 As bumbling policeman ‘Tom Campbell’ Bernard unwittingly gets caught up with Peter Cushing’s second big-screen appearance as the Doctor, in a rewriting of the TV serial involving Robomen and sinister Daleks roaming the streets of a conquered London. In a neat full-circle plot-device the Tardis even allows ‘Tom’ to revisit the opening scene of a jewellery-shop raid, at the film’s close, moments before it happens, allowing him to take full credit for foiling the crime! ‘Peter Cushing was a giggler’ Bernard once confided, about the film experience.